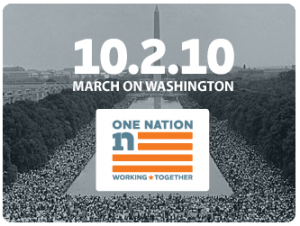 As you may already know the NAACP has called a national march for jobs and justice on Oct 2, 2010. The AFL-CIO, La Raza, SEIU, and the United Auto Workers have now joined in support with One Nation United serving as an umbrella organization. 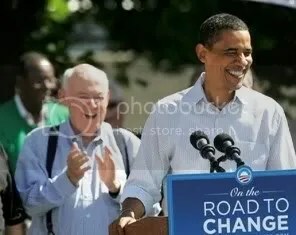 The Progressive Democrats of America and over 190 other organizations are involved with other organizations joining in. Why should we who focus on peace join a labor and justice march on Washington this fall? Don’t issues of peace and justice connect intimately through economics? Peace is necessary in order to have an effective impact on the issues of jobs and justice being taken up by those organizing the October 2nd march. Competition for resources from the war machine needs to be exposed. To date the U.S. has spent cumulatively over $1 trillion on the wars in Afghanistan and Iraq1. Total annual U.S. defense spending is around $1 trillion dollars2 ,. Little is left over in the annual federal funds either on or off budget to recover economic rights or safety net structures of the past, let alone to address new social needs.